Superior Rooms are filled with the authentic Russian elegance that has long defined our hotel. Windows face out onto the inner courtyard. 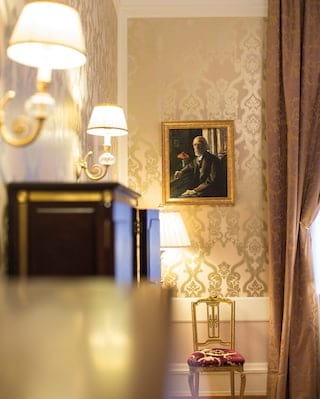 With impressive views of the Philharmonic Hall and Mikhailovskaya Street, these comfortable rooms are perfect for watching city life roll by. These plush, indulgent rooms enjoy superb views over Arts Square and the Russian Museum, a beautiful green space in the heart of the city. Savour stunning views of Arts Square and the Philharmonic Hall. Located on the Historic Floor, rooms boasts dramatic high ceilings and exclusive butler service. The top-floor Terrace Rooms, styled like luxury private residences, offer spectacular views and picturesque terraces perfect for warm summer evenings. Explore our other accommodation options and find your perfect hideaway.